A is correct. StoreOnce uses Catalyst client for source-side deduplication and connecting to Backup Software. Which backup solution helps accomplish this? C. Encryption is a function of the backup application. When zoning by NBA port in large SAN infrastructures, which feature is a benefit? A Customer has a legal requirement to encrypt all of their backup data that goes offsite. the encryption keys and the ability to restore their data. Which type of HPE Backup and Archive configuration is displayed? should you recommend to reduce individual files' restore times? A. Convert from file-based backups to full backups. A. 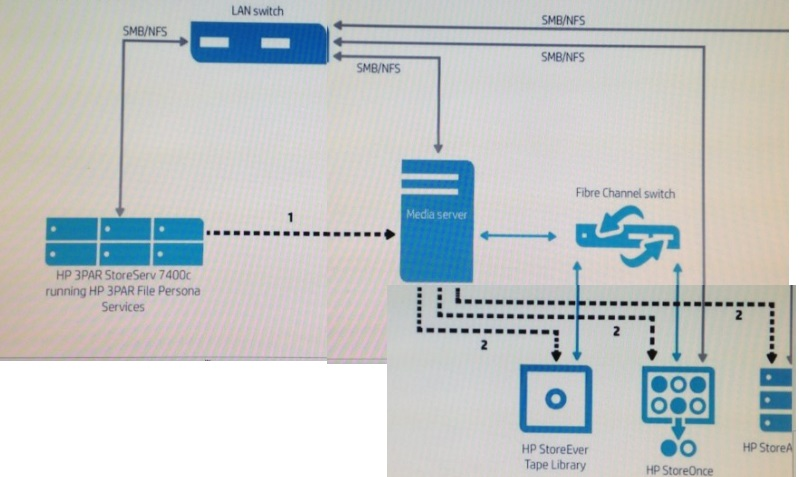 Mount the snapshot to a DR server and back up to the HPE StoreEver tape library. B. Copy the snapshot data to the HPE StoreEver tape library using the LTFS functionality. C. Directly back up the snapshot to the HPE StoreEver tape library from the HPE 3PAR StoreServ. What is a disadvantage of Breakaway Mirror Clones? A. Data is at risk during the break. B. Deleted files are not tracked. C. Multiple sets of data exist. D. They increase the I/O load to resynchronize. Answer : D Breakaway mirrors are reliable, but they require at least two sets of data. They require additional storage and generate I/O traffic needed to synchronize the disks after backup. To reduce these "disadvantages", copy-on-write was developed. You size an HPE Recovery Manager Central (RMC) solution for a customer's environment. What is the minimum configuration that must be planned for the RMC host? Test/Dev environment located in the same datacenter. A. Set up HPE 3PAR synchronous replication between the production and Test/Dev disk arrays. B. Create a snapshot of the replicated volumes on the production array and present to the backup system. C. Set up HPE 3PAR synchronous replication between the production and DR disk arrays. D. Create a snapshot of the replicated volumes on the Test/Dev array and present to the backup system. E. Set up HPE 3PAR enhanced asynchronous replication between the production and DR disk arrays. Which statement is correct about virtualized snapshot services on an HPE MSA 1040? B. Some operating systems support snapshots. C. The HPE MSA 1040 does not support virtualized snapshots.